7/20 Cup of Coffee: It was a busy night down on the farm, with a no-hitter from the Greenville Drive being the top story. Enmanuel De Jesus (pictured, right) threw the first 7 2/3 innings, and Devon Fisher and Durbin Feltman combined to get the final four outs. Michael Kopech also faced a Boston affiliate for the first time since he was traded for Chris Sale, while William Cuevas, Teddy Stankiewicz and Darwinzon Hernandez all added strong starts. Rusney Castillo returned from his groin injury, and Bobby Dalbec hit his 51st extra-base hit of the year, tying him with Rafael Devers for the most ever by a member of the Salem Red Sox. It was a pitcher's duel between William Cuevas and Michael Kopech, but the Knights scored one in the eighth and one in the ninth for the walk-off victory. Cuevas struck out eight over seven innings, with a two-run home run in the fifth being his only blemish. He was let down by the bullpen, with Ty Buttrey serving up the tying run in the eighth and then walking the leadoff man in the ninth. Kyle Martin came in and allowed three more walks to force in the winning run. Kopech struck out nine and walked only one over his six innings, but the PawSox did get to him for seven hits. Rusney Castillo had two hits in his first game back from the disabled list and he also stole two bases, and Tony Renda went 2 for 5 with a double. The Sea Dogs dominated in every facet of this one, with Teddy Stankiewicz's eight strong innings leading the way. He was very efficient, tossing 100 pitches and striking out five without walking a batter. He has turned a corner over his last six starts, going 37 2/3 innings and allowing 14 runs, lowering his ERA from 6.13 to 4.62. The offense was led by Josh Ockimey, who went 3 for 3 with a home run, a double and a walk. Ockimey was 2 for his last 22 entering the game, and he is hoping this could be the start of another hot streak. Jhon Nunez went 3 for 4 with a double and a stolen base, Deiner Lopez went 2 for 4 with a double and Danny Mars went 1 for 3 with a home run and a walk. Three Salem pitchers combined to strike out 15 Astros in an impressive victory. Darwinzon Hernandez's incredible month continued, striking out seven, walking one, and surrendering only one run over five innings. He is now 4-0 in July with a 0.42 ERA over 21 2/3 innings. Joan Martinez struck out four over two innings, and Harrison Cooney finished off the final two innings with four strikeouts of his own. The big hit of the day came from Ryan Scott, who launched a two-run home run that proved to be the difference. Michael Osinski added three hits and Bobby Dalbec added his 16th extra-base hit of the month with a double, while also drawing a walk. Enmanuel De Jesus took a perfect game into the eighth, and Devon Fisher and Durbin Feltman combined with him to finish off a no-hitter. It was a very bizarre line for De Jesus, as he was perfect through 7 1/3 innings before hitting a batter. The runner moved to second on a wild pitch, and then with two outs in the inning De Jesus got a strikeout, but the catcher threw the ball away allowing a run to score. This was the end of the night for De Jesus, with Fisher getting the last out in the eighth and then Feltman striking out two in a hitless ninth. This is the first no-hitter for the Drive since 2012. The offense was very balanced, with four players having multi-hit games. Tanner Nishioka, Marino Campana, and Garrett Benge all hit solo home runs, and Pedro Castellanos went 2 for 5 with a double. 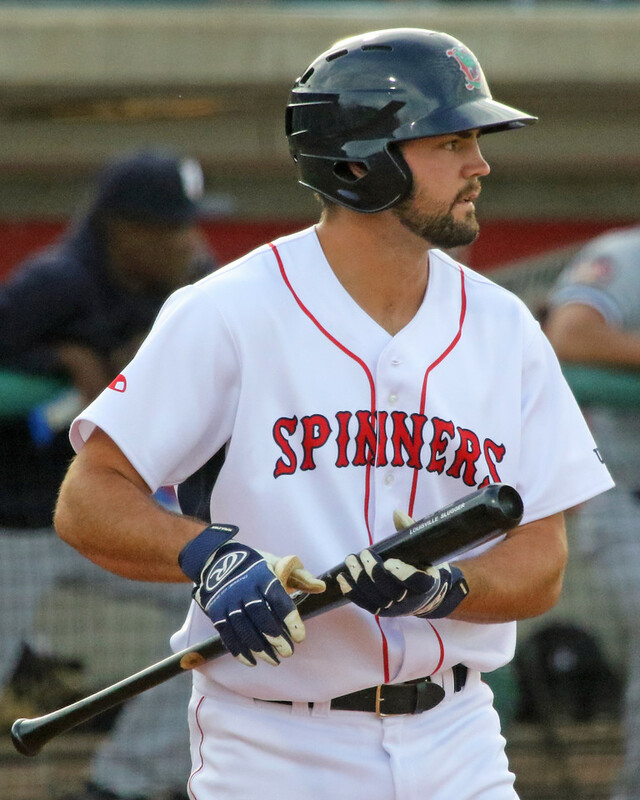 It was a slugfest in Lowell, with Devlin Granberg (pictured, right) and Jarren Duran leading the Spinners to victory. Duran went 2 for 5 with a triple, a walk, and three RBI, and Granberg went 3 for 4 with a double, walk, and three runs scored. Lowell needed the run support, as Aberdeen put 16 men on base. Brian Brown allowed three runs over the first four innings to raise his ERA to 2.55. 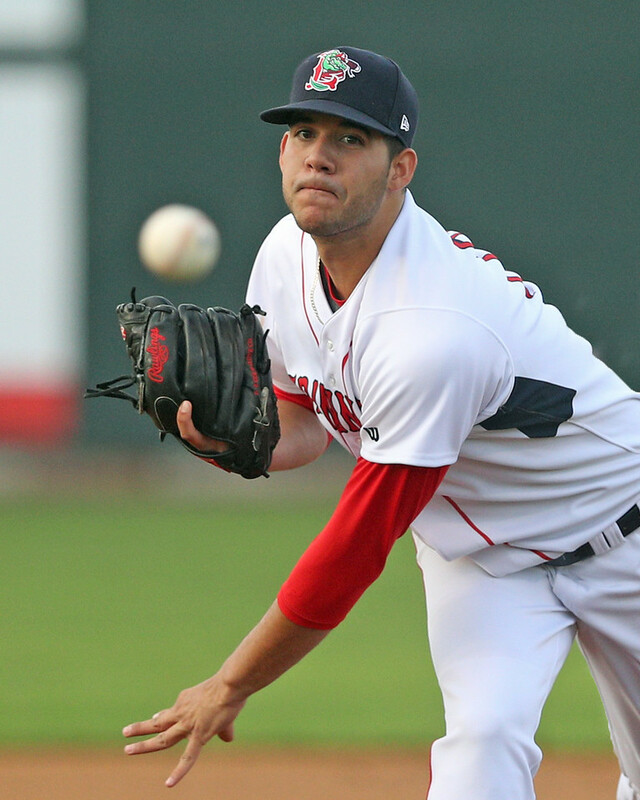 Kris Jackson made his first appearance for the Spinners after being called up from the GCL, striking out 1 in a scoreless inning. Another strong start from Yasel Santana was not enough to beat the Rays. Santana allowed only one earned run over five innings, striking out three without walking a batter. Santana has yet to allow more than one run in any of his six starts and his ERA now sits at 1.61. Austin Glorius continued his rehab with two hitless innings, striking out one. Three of the team's six hits came from Nicholas Northcut, who went 3 for 4 with an RBI. Lane Milligan continued his good stretch, going 2 for 3 with a walk and he is now 13 for his last 30. A wild start from Kelvin Sanchez doomed the Red Sox, and the rain prevented any chance at a comeback. Sanchez walked six and allowed three runs while recording only four outs, but Yoelvis Guedez was able to limit the damage by allowing only one run over the final 4 2/3 innings. Gilberto Jimenez had the only offensive performance of note, going 2 for 4 with a double, and six different batters drew walks. This one was shortened by rain as well with the Red Sox failing to capitalize on numerous scoring chances. The offense had 10 hits but went only 2 for 10 with runners in scoring position. Angel Maita continued to rake, going 2 for 3 with a walk, and Luis Hernandez and Yulis Hernandez each added a single and a double. Irvin Villarroel was let down by his defense, and he took the loss after surrendering three unearned runs over four innings. Richardson Jimenez had a rough professional debut, allowing two runs on two walks and a hit without recording an out. Player of the Night: There were many worthy candidates, but taking a perfect game into the eighth inning gives this one to Enmanuel De Jesus. The 21-year-old followed up seven strong innings last time out with an even better outing on Thursday. This was the third no-hitter in franchise history and the second in a nine-inning game.